A complex piece of hand-assembled machinery. 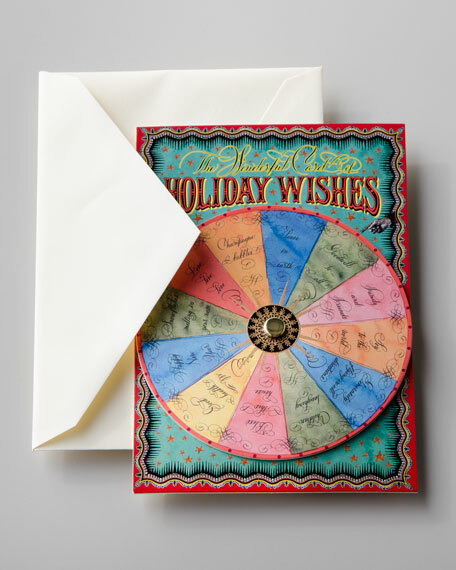 The spinning wishing wheel, made from and mounted on deluxe heavyweight card stock, reveals your holiday fortune. Accompanying blank sentiment card engraved with gold snowflake. Sealed and delivered in a lined outer mailing envelope. Set includes one card and one envelope. Hand painted and handcrafted in the USA. An internationally renowned calligrapher and artist for more than 30 years, Bernard Maisner weaves his talents into his stationery. These works of art feature beautiful calligraphy, gilded engravings, and unique inks. Many are hand-painted originals, making them highly collectible. For in-store inquiries, use sku #157229.